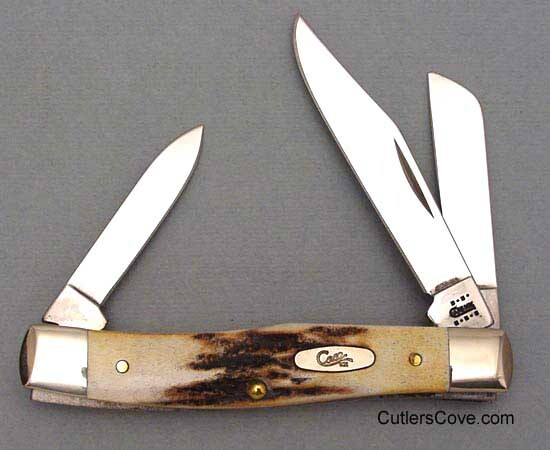 Case Sambar Stag Medium Stockman mint in the box. It is 3-1/2" closed with square bolsters. Pattern 53032SS. Stag is a natural handle material, no two will look the same. The photo is for illustration of the pattern type and not the particular knife handle you will be receiving. Genuine Stag is a natural horn and therefore will vary in color and tone. Because each knife has natural handle materials no two are exactly the same. Therefore your knife will not match the below picture for color or figure. We can not control what the handles will look like because each is unique and natural. Each handle will be genuine Stag in natural colors ranging from light tans to dark browns. All of our products have our hassle-free return privilege, which allows you to return any item for any reason within 14 days of purchase. For complete return details click here. "As many of you already know, the supply of stag has been interrupted by an Indian embargo. We at Case understand how important stag is to collectors. While no stag handle knives appear in the 2001 catalog, Case is working hard to make acceptable substitutes until such time as the stag embargo is lifted. Indian stag comes from the naturally shed antlers of a particular native Sambar antelope. Sambar stag has proven, throughout the years to be of a particular density that makes superior handle material." No sale. The coupon does not apply to this item.